All options are saved.This means all checkboxes, text fields will remember your change. Create file layers. Create a layer for every file and add the file contents to it. Reset geometry. Apply the boxmethod to every object (reset transformation etc.). Optionally move the pivot to the origin. Delete turbosmooth. Delete the TurboSmooth modifier before exporting. Name change. Add prefix and/or postfix to the name of the objects before exporting. Combine collision mesh. Mesh with the same name and the given prefix/postifx will be exported together (ex. UCX_). Combine LOD's. Meshes with the given prefix/postfix will be exported to the same file. For example _LOD* (* means numbering) for unity. Group support. Objects in a group are automatically exported to the same file. If the Collapse groups option is enabled, the group will be collapsed to one mesh. 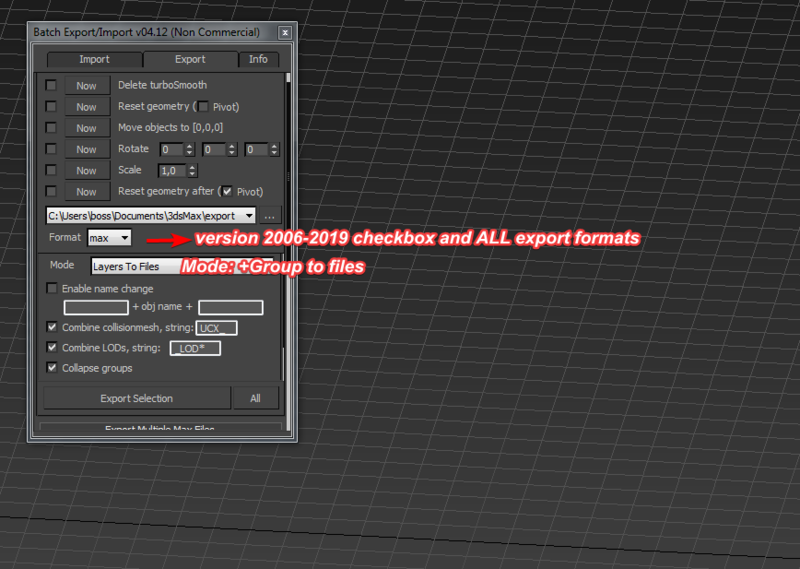 FBX export options. Use the FBX Preset option under the advanced section. So no need for an export scene. You can check the options and everything will be perfectly exported. After exporting the scene will be restored. This script has been updated several times by user requests. If you have any remarks, requests or feedback, feel free to contact me. The new version now has a installer. Just run the .mzp file to install the script. Submitted by deepelements on Thu, 2019-04-04 07:32. Hey guys I have some old files i need to import into max but i only have the .s3d file. I've tried all the online importers, blender, maya with no luck. Anyone know how I cant make a max script to import them? I think the files were .ase before they were converted to .s3d. I use to have an importer for max but that old machine died and i lost the script. Submitted by hippiearchitect on Tue, 2019-02-12 07:58.
i have loads of models all in different units. so when i run the merge script they all come in at different scales. would it be possible to build in a correction for this? Submitted by BidetPower on Mon, 2018-12-31 11:32. Nif option for export not available? This tool will save me a lot of time in converting objs to nifs, but for some reason nif isn't showing up in the dropdown. Submitted by suam on Fri, 2018-11-09 09:15. Hi is there only import options? obj and fbx? i tried stl. and i do get the options dialog. but it only aplies to the first object in the list. the rest gets imported with default settings. why dossent it apply the settings selected in every import? its seems like a bug. Submitted by jos on Fri, 2018-11-02 02:53. Submitted by Teriander on Thu, 2018-11-01 15:49. Jos, your website appears to be down and the email in the script is no longer valid because of this. How can I contact you? Submitted by dub73 on Fri, 2018-10-12 08:34. Submitted by Artemcg on Mon, 2018-07-09 09:11. Submitted by Smallpoly on Tue, 2018-02-20 12:55.